For the most effective selectionand breeding, it is necessary to adhere to a certain breeding system. Unfortunately, most Russian breeders do not follow this rule. Their breeding in the terms of pedigree work is called random-breeding, or random crossings. With random-breeding almost no related matings take place, and the few closely related matings, which are rarely performed, do not have signs of any sense of purpose. Inexperienced breeders tend to avoid affinity breeding, like the plague, and prefer all sorts of unrelated options for unrelated matings — the so-called outbreeding. They motivate this, as a rule, by the fact that inbreeding leads to degeneration, for some reason understanding this word as the appearance of «freaks». Under freaks in this case equally means mutants, weak and sick animals. In this sense, outbreeding can be dangerous no less than inbreeding, and it is also fraught with a not so fatal, but unpleasant result: a simplification of the type of offspring. The mechanism by which qualitative, but heterogeneous genetically sires and dams can produce offspring of a weak breed type has already been analyzed in the section on inheriting morphological traits. However, the consequences of outbreeding can be much more serious. Everyone knows that hybrids between animals of different species are often sterile. It often happens that these hybrids do not reach normal parental sizes, remain underdeveloped. These developmental disorders, called hybrid dysgenesis, stem from the incompatibility of the genetic systems of two representatives of different species. After all, a living organism is an entire system, and during its development, genes must be included in work in a determinate order, and the activity of some of them affects the inclusion or deactivation of others. In a hybrid animal, this system is broken, the genes, so to speak, do not fit together. About the same often happens when two cats of the same breed are crossed, but belonging to different populations and having no common ancestors are crossed. The consequences are usually not as tragic as interspecific hybridization. Particularly noticeable deviations in those breeds, which development is significantly different from the natural. For example, there are two variants of the development of the head in Persian kittens: in some kittens there is an intensive growth eyebrow ridge and zygomatic bones from a month old and older, in others there is a outrunning growth of these areas, and by the age of 1.5-2 months growth rates of the bones of the skull are aligned. What happens when such cats are crossed is exactly a violation of the development of the skull and facial skeleton? An analysis of the pedigree of anomalous animals showed that any displacement of the jaws and the asymmetry of the head structure in Persians, the underdevelopment of the upper jaw in Orientals and Cornish Rex, as a rule, is the result of outbred dysgenesis. In breeds with a type of development close to the natural, a single outbreeding does not give so visible consequences. But the constant “pumping” of uncontrolled genes with regular unrelated matings leads to imbalance in the genome: animals cease to be balanced, imbalances appear in the structure of the body and head, the angles of bone joints, correlations of the muscular system and ligaments are disturbed. This is not a call to stop unrelated crossings and go exclusively to inbreeding. Within reasonable limits, reasonable outbreeding is necessary for the progress of the breed. But it is impossible to make this type of crossing the main, if not the only method of breeding. All breeding systems are based on inbreeding. Related matings are necessary in order to genetically fix the traits, that is, to achieve homozygosity for the genes that determine them. It is clear that in litters received from homozygous parents, there will be no splitting of kittens by external signs. Inbreeding is carried out on an outstanding by its exterior qualities — a sire or a dam (less often — a couple), which — ideally — should be highly prepotent in terms of a complex of significant features. In addition, this cats should not be the carrier of recessively inherited anomalies. After all, those breeders who do not put inbred crosses, fearing «degeneration», in fact, are afraid of precisely hitting the homozygous form of these mutant alleles. But there can be no real degeneration, more correctly, inbreeding depression, neither in the first nor in the second generation, even with the closest inbreeding. Inbred depression is a decrease in immunity properties of an organism, sexual potency, fecundity, the appearance of abnormalities during pregnancy, kittens growth retardation — can indeed be observed with long-term (over several generations) inbreeding. It is not connected with specific genes of diseases or anomalies, but with the accumulation of alleles of complex action, reducing viability. As already noted, the genes of «household», that is, providing metabolic and other physiological processes and the immunity, are represented in the genome by a large number of copies. At the same time, mutations that disrupt the normal activity of a gene can accumulate in parts of these copies. As a rule, they do not interfere with the vital activity of the organism, since all the necessary biological processes are carried out on the basis of the work of other, full-fledged copies of the same gene. But with long-term inbreeding, generations can accumulate (just like any other alleles, turning into a homozygous status) these mutant copies. As a result, there is a decrease in viability. In this case, of course, it is necessary to stop inbreeding and to set unrelated crossings. However, inbred depression is not a necessary consequence of inbreeding. In the same way as mutant ones, normal multiple copies can accumulate. As a rule, inbreeding is used only in the conditions of a breeding program or breeding system. The breeding system allows you to control the generational rate of gene transfer to the homozygous status. Than inbreeding is closer, the faster the process transfer to the homozygous. Depending on the degree of inbreeding, the system of breeding can be divided into hard and soft, and depending on the characteristics of the use of related matings — regular and non-regular. Hard regular breeding systems are backcross, or back-crossing, and sibcross, or brotherly-sister crossing. With backcross, a representative of each generation crosses first with one of the parents, and then with one of the descendants obtained from the previous crossing (pic. 12a). When sibcross in each generation brother and sister are crossed (pic. 12b). Both of these methods are aimed primarily at consolidating the characteristic of the ancestral pair of cats. To carry out such crosses, both ancestors should not only have the remarkable qualities described above, but also give relatively homogeneous offspring. The classic backcross is rarely used in breeding cats. As a rule, simple back-crossing is used, referring rather to the grading system, which will be discourse below. Sibcrosses are somewhat more common, but are usually limited to two generations of sibling crossings. The complexity of such matings is probably purely technical: even in a large cattery, it is difficult to leave diclinous animals from each generation. 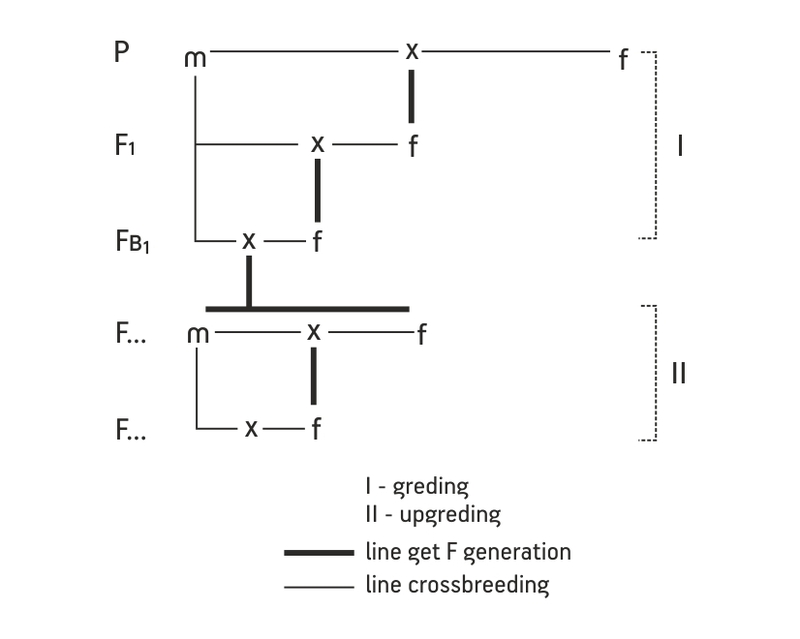 With these breeding systems, the rate of gene transition to the homozygous status is the highest, as is the likelihood of a rapid onset of inbreeding depression. Mild regular breeding systems include mating of four- or first-cousin siblings (brothers and sisters) (pic. 13). This method is used for the same purpose of complex consolidation of characteristics (from each cats from the ancestral pair). In large catteries, catteries associations or breeding centers, this system is more often used for breeds that have a close to natural appearance. The level of heterozygosity in these breeding systems does not decrease as fast as in backcross and sibcross. Perhaps the most common non-regular breeding system — the so-called «closed». It is used in linear breeding, which will be talk below, and in nonlinear, in combination with a careful selection of cats. With such a system in the cattery at the same time contain 1-3 males and from 3 to 10 females. The best representatives are selected from the progeny of the original pairs, of which pairs of the second stage are already formed. With each generation, these operations are repeated, and cats from other breeding are not used in the cattery and the number of males and females used remains unchanged in each generation. The most zootechnically expert and giving the highest results is the linear breeding system, or line breeding. This is the main method of breeding, usually easily implemented in a stable population or a fully formed breed. Actually the breeder line is a group of animals, leading from an outstanding ancestor, which is characterized by typical for him valuable characteristics steadfastly preserved in the offspring subject to the selection and culling. Of course, such a line is also characterized by periodic, usually moderate inbreeding on this outstanding ancestor, or ancestor, by name which it also receives the name (for example, the Dundee-P.fon Mokezu line is in Orientals). From the ancestor of the line requires good health, high fecundity, excellent exterior qualities, high prepotency on a number of necessary characteristics and the absence of a carrier of harmful mutations. The latter is especially important — otherwise, along with the consolidation of the type of the ancestor, these mutations will occur, and this will also be accompanied by periodic splitting out of sick or abnormal descendants. The inbred line differs from the breeder one only in the degree of inbreeding — in it is near or close. The intensity of selection and culling in inbred lines, of course, is very high. Nevertheless, it is often preferred to work with many small animals (including cats) using this method of line-breeding. Finally, the formal line is a group of animals leading from a common, outstanding ancestor, but not retaining his characteristic features and differing in their types. Selection and culling in such a line is not conducted, so that the high results from such a «linear» breeding are highly doubtful. The term “line” is usually used if the ancestor is a male, which, of course, is more common for the reasons already mentioned. If the common outstanding ancestor is the female, the term “family” is used. By the way, in our country, owners of small catteries often cannot afford to keep males and are limited to keeping several breeding females from different generations. Breeders find partners for these females in other catteries. In this situation, breeding by family acquires special significance, replacing the more usual linear one. However, the methods of working with lines and families in relation to cats practically do not have differences. Of course, every line is not perfect and is distinguished by its characteristic features, both advantages and disadvantages. For example, the line of Siamese cats can be characterized by such common for ancestor, and all representatives of the line virtues: a straight profile, a long even wedge of the head, a graceful body type, a poorly developed undercoat, and common disadvantages in it: high-set ears, a short tail. Of course, the selection of pairs within the line will be oriented to overcome these shortcomings. If a male appears in it, deprived of one of the shortcoming of the ancestor, then he can become a continuer of the line, and the line will receive a double name. 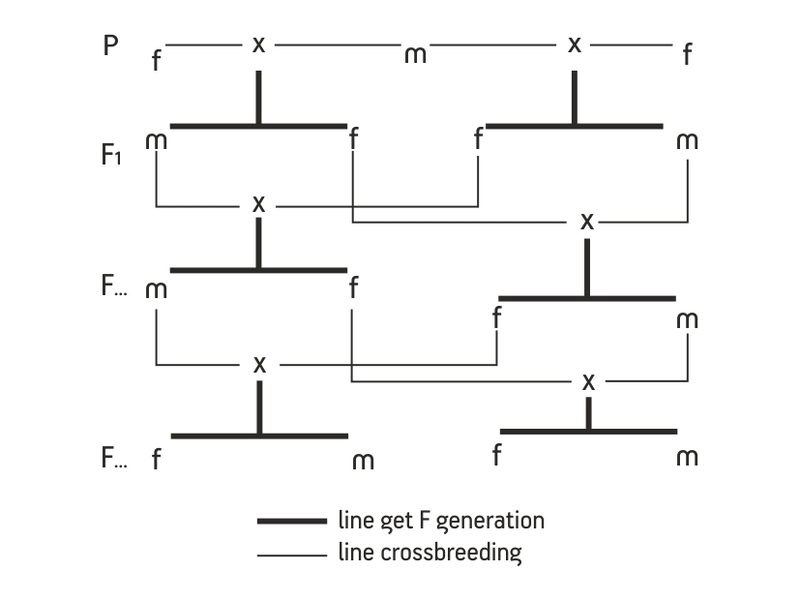 The first stage of work by linebreeding is usually characterized by intralinear breeding, when a common ancestor occurs in the mother and father in a straight male line. Intralinear breeding serves to firmly anchor the type of ancestor. This type of breeding is not usually of a long-term nature due to the large culling in the offspring, since it is almost impossible to find the ideal ancestor. Eventually, each line be at the end of row — partly due to the achievement of complete stabilization of the genome, which closes the path of further progress, partly due to inbreeding depression. At the second stage of work with the line, breeders often use its update — through the most typical, but improved offsprings, who act as followers of the line. This is how branches of one line are formed. • father and mother belong to different lines, but in both pedigrees found the ancestor of the third line. 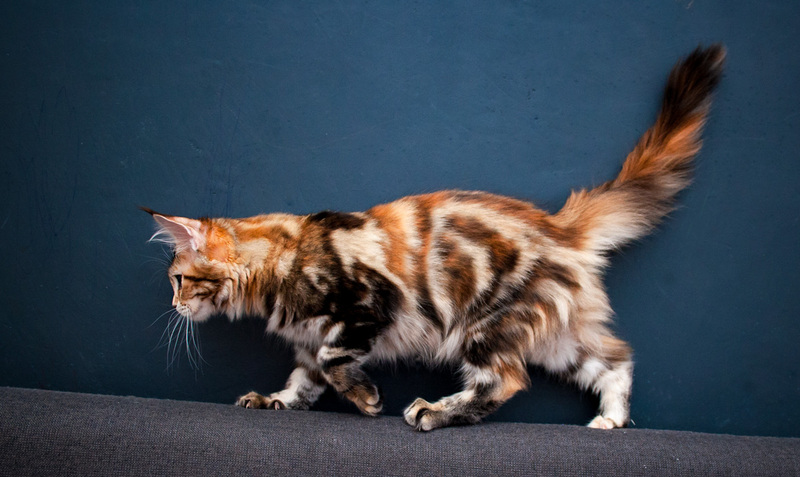 All three of these types of linebreeding can be easily found in the pedigrees of Exotic and Persian from American catteries. Often used in such a way to reduce inbreeding in the population, as a simple mating of inbred males of one line with females of the other — incrossing, or the mating of inbred males with outbred females — topcrossing. When crosses, not all lines fit well with each other. The same dangers of hybrid (outbred) dysgenesis or elementary type simplification arise in them. 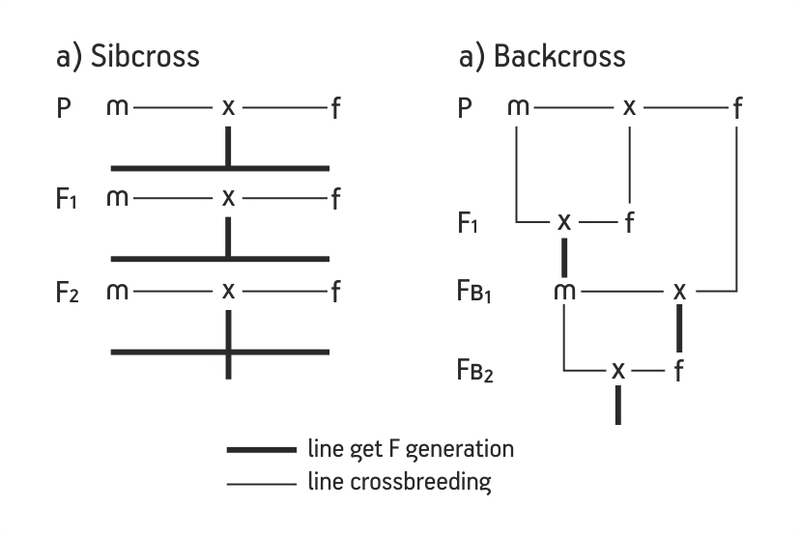 Therefore, you should carefully consider all the options for successful and unsuccessful linecrosses before repeating any options for the selection of inbred-linear pairs. However, in interline crosses there is another positive side, namely heterosis. This phenomenon repeatedly described in the literature is most characteristic not for an outbreed at all, but for outbreeding in the form of interlines crosses. The content of this concept is the opposite of inbreeding depression: by increasing heterozygosity in repetitive genes necessary for the vital activity, an increase in viability, fertility, and sometimes in animal size. Improving mating is one of the main methods of working with young, newly formed populations of the breed. Typically, such populations are characterized by the presence of 1-3 high-class representatives of the breed (often males) with a generally low level of population. The main options for working with this method are the so-called grading and upgrade. Highbred males act as improvers (the requirements for them are the same as for the ancestor of the line, their inbred origin is also desirable). Such an improver of the breed mates with several outbred, but of the same type, with insufficiently pronounced breed characteristics females then with their daughters and granddaughters (grading). Subsequently, from the second, third, or even the fourth generation of such inbred descendants, the most qualitative successor of the improvement of the breed is selected and mated with representatives of subsequent generations (upgrade) (pic. 14). In Russia and Ukraine, well-planned grading when working with Persian breed, in particular in colorpoint, proved to be a good idea. In zootechnics in a similar way, they also carry out breeding work with new breeds created based on aboriginal population, carrying out so-called absorption crossings. In the usual practice of breeding, the selection of individuals is applied. However, can be used more efficient selection by family. Usually, breeding ignores related relations, and the best animals are selected, regardless of their origin, from all litters obtained in the cattery. However, one pair can produce a greater number of high-quality offspring’s than others. You can estimate the quality of litters, for example, using the same method of breeding indices: the litter index can be defined as the sum of the indices for each of the kittens, divided by the total number of descendants in the litter. Parents who have the highest litter rating are the best. Those parent pairs that give offspring of poor quality should be rejected or at least reformed. Selection by family is much more stringent than individual selection by phenotype. Selection by family can give the highest results when combined with systemic breeding. Counting the total index of the offspring of two related lines can show high quality in one and low in the other. In this case, the breeder can stop breeding with the low quality and form two new lines based on the best. Similarly, can be assessed two groups of cats bred in a “closed” system. Suitable for family breeding and “closed” system with 2-3 males. Since with her in each generation a constant number of females is preserved, the comparison of the litters received from the same group of females with each of the males will be successful. This will make it possible to determine the best female. Perhaps a combination of family selection with a related breeding, and in cases where the male interbreed with several sisters or daughters. The offspring from each crossing is evaluated in comparison and for further breeding; the offspring are selected from the female with the best litter. With family selection, there is always the possibility to determine combinations of parental pairs that consistently produce high-quality offspring.